Hello hello! Do I have a fun post for you! Everyone likes emojis, right? Well! 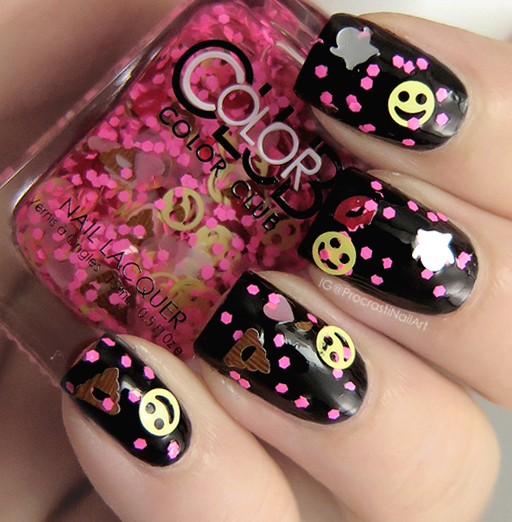 How about emojis FOR YOUR NAILS? WHAT. 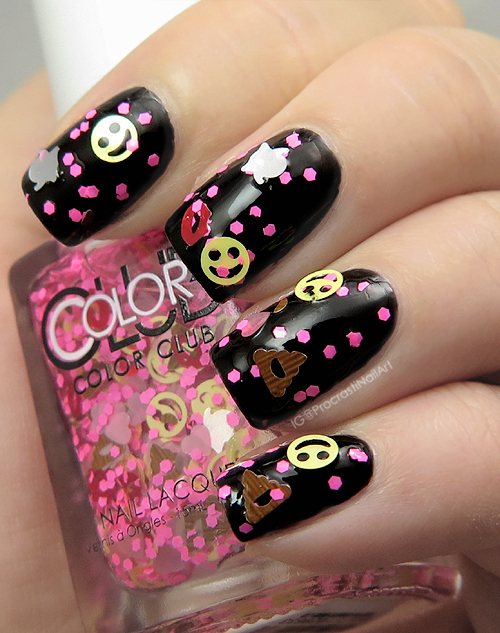 Today I have the full Color Club Nailmoji Neons Collection to share with you. 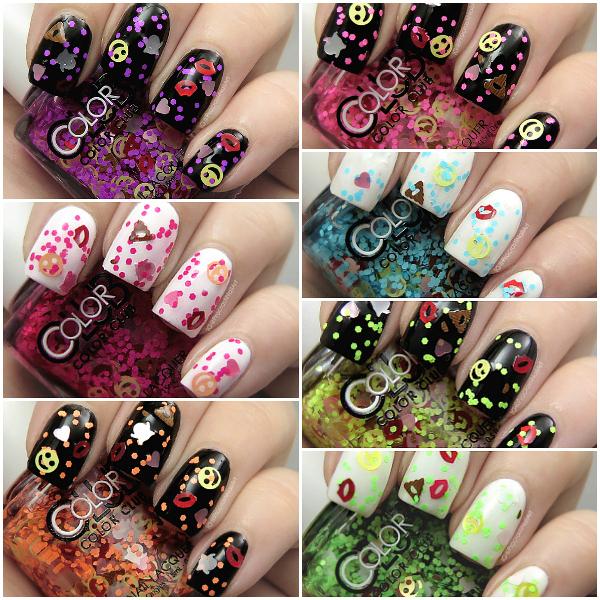 It's a set of 7 polishes all featuring coloured hex glitter and a variety of emoji glitter, and each is made in special microbatches. The shapes included are kisses, smiley faces, ghosts, hearts and poo/pudding emojis! The amount of glitter in these toppers is really generous so there is no issue in needing to fish to get the glitter out, which is awesome. Let's take a look! First up we have OMG which is a bright neon pink glitter with a mix of emoji glitter. This is the lighter of the two pinks in the collection, and I love how it pops off of the black background! 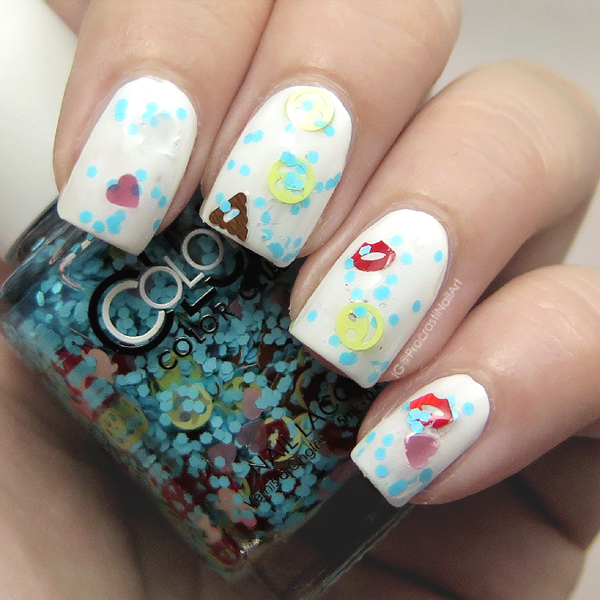 Chill is an icy bright blue glitter packed with emoji. 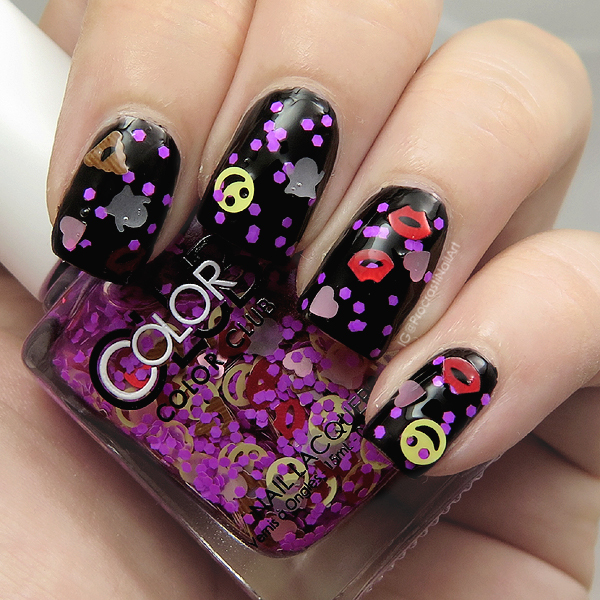 As you can see swatching this over a white base means the ghost emoji (there's one on my pointer) don't really show up, but I feel it emphasizes the colours of the lips and hearts better than the black. JK is the yellow neon glitter of the mix, and this polish is nothing to joke about (wawon, bad joke alert)! 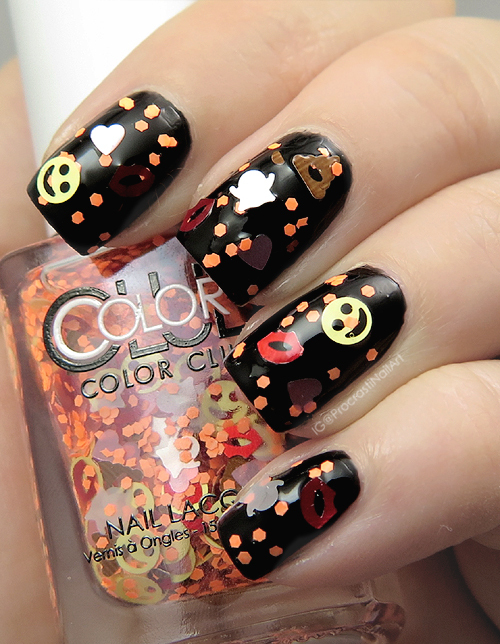 Like the other toppers in this collection this applied well, and the emoji glitter were pretty easy to get out. 100 is a lime green neon glitter topper mixed in with all the emoji. It was harder to find the poo and ghost emoji in this bottle but as you can see I did fish one of each out - the ghost is hidden against the background on my ring finger! 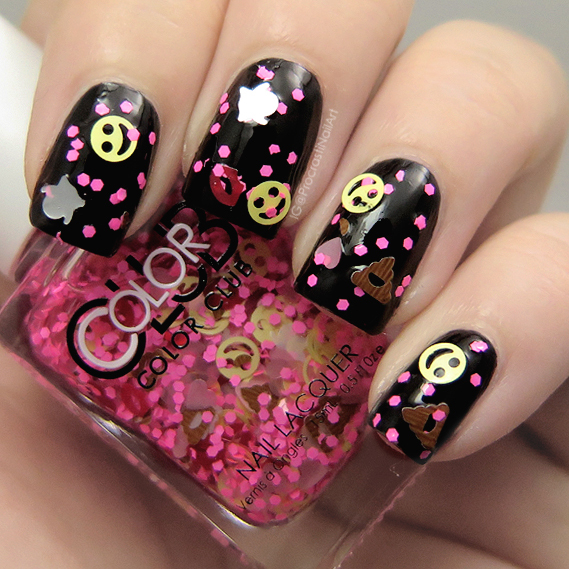 YASSSS is the deeper pink glitter of the set and it is fun to say and even more fun to look at on your nails. :) This also shows one of the reasons I swatched some of these toppers over white - whether on purpose or because of minor glitter bleed, you can see the clear base has been slightly tinted with pink. And last but not least is my absolute favourite, Squad! This is a bright neon violet glitter mixed with emoji, and this bottle was a bit heart-heavy (which I totally don't mind). It's heart heavy because it loves me back! Awww! Haha. 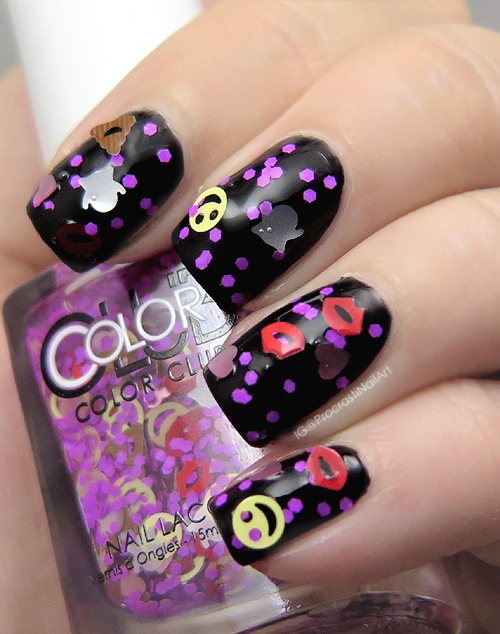 Overall the shapes that came out the easiest/seemed most plentiful were the smiley faces and the kisses. The poop/pudding (lol) emoji was the most scarce, followed by the ghost. For application I recommend doing what I did for these swatches: paint on one coat of glitter normally to get a scattering of coloured glitter and a small handful of emoji glitter across the nails, and then use the sponge/placement method (like the one I used for this tutorial, but with a toothpick) to fish out and apply extra emoji. 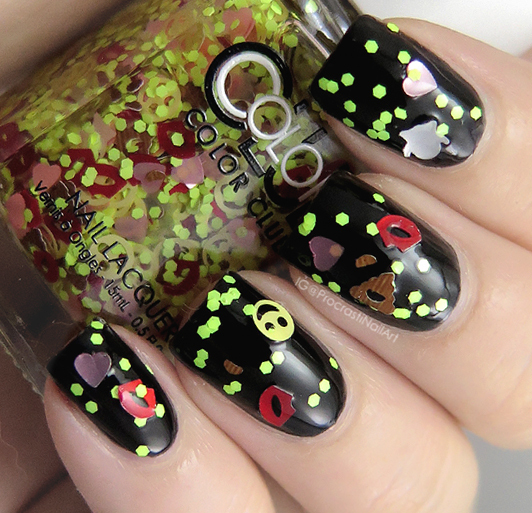 Which one is your favourite, and do you prefer them topping black or white polish? Is there another colour you wish I had swatched them over? Let me know! You can visit Trade Secrets in store or online for a variety of beauty and nail products available in Canada! You can also visit them on facebook, twitter and instagram. Hahah even writting "poo emoji" in this post made me crack up! Some super fun glitters these are. 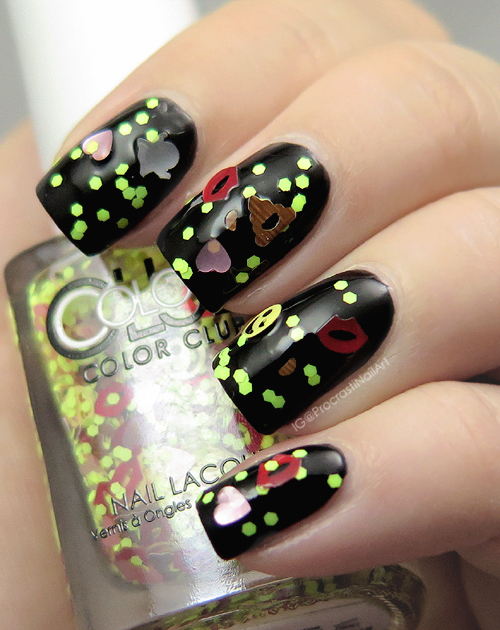 Fun idea, but way to big glitters for me. 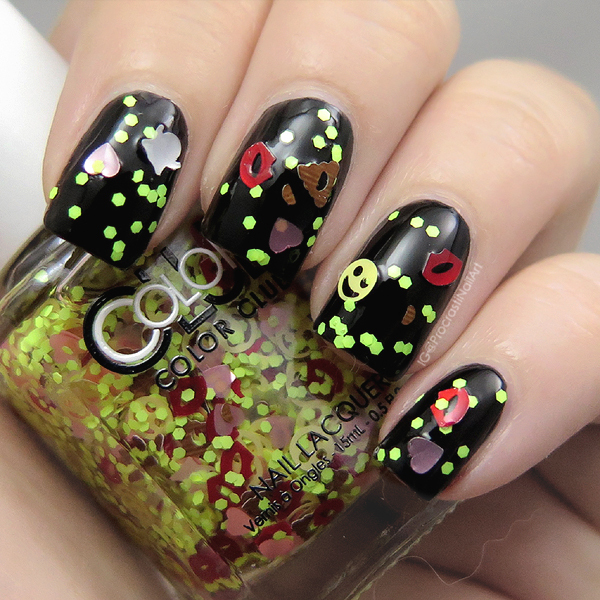 I love these but not sure how my boss would feel about me showing up with poop emojis on my nails! Errrr......these aren't my taste, but they are fun. 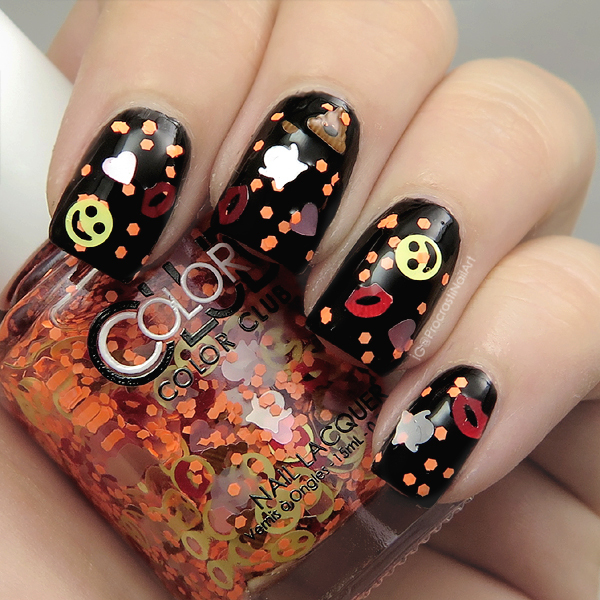 Not really a fan of polishes like this but they would be a lot of fun for Halloween. 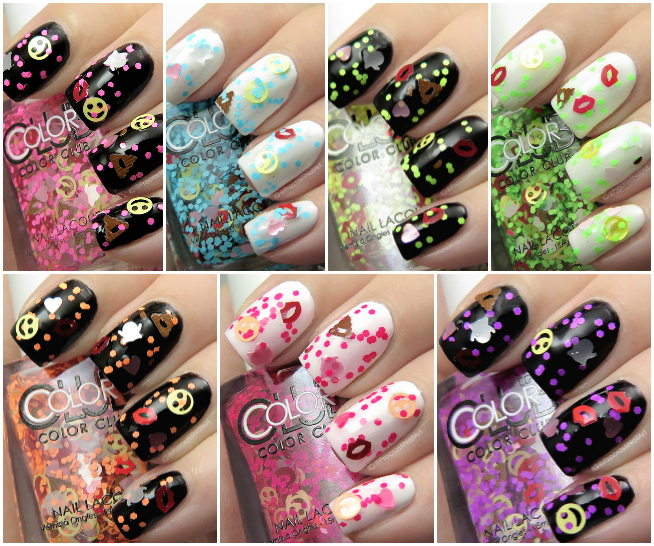 Half of me wants to not like these because of the big glitters, but the other half of me is cracking up over the thought of wearing poop emoji nails to work....so, I think I'm going to have to buy all of these haha! While these are cute, bright and fun they just don't do it form me. But I've never been a fan of all the shaped glitters in nail polish. You have some amazing swatches of them though and make them look amazing. These are cute and super fun. My girls would love them. As much as I find them super funny they just don't work for my taste! This would be perfect for a child/teenager! I'm surprised they apply and stay so easily. Sorry Color Club, not a fan of these.